The No. 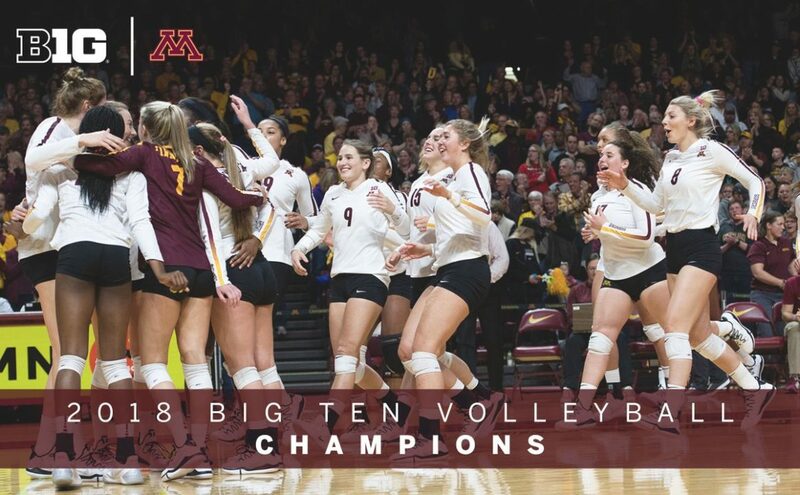 3 University of Minnesota volleyball program clinched the Big Ten Conference title outright tonight in Columbus, Ohio during a five-set thriller. The Golden Gophers (24-2, 18-0 in league action) won the match 23-25, 25-20, 25-13, 23-25, 15-11. The 2018 championship marks the third conference championship for the Gophers in program history and the second since 2015. Minnesota clinched the title outright on the last game of the season in 2015, while the Gophers still have two matches remaining in the 2018 regular season schedule (Penn State and Rutgers next weekend). With the win, the Gophers also punched their ticket to the NCAA tournament. With no conference tournament in volleyball, the Big Ten regular season champion solidifies the league’s automatic bid. Regan Pittman led the team with a career-high 20 kills while hitting .594, and also chipped in three aces. Stephanie Samedy notched a double-double with 17 kills and a team-leading, and career-high, 21 digs. She also posted a career-high five aces. Alexis Hart recorded 14 kills and was followed by Taylor Morgan who added 11 kills while hitting .500. Morgan had a team-best four blocks. Samantha Seliger-Swenson recorded a new season-high 58 assists. CC McGraw produced 18 digs and was followed by Adanna Rollins with 10. The Gophers outhit Ohio State .315 to .207. As a team, Minnesota recorded 74 digs, 68 kills, and seven blocks. The Gophers also had a season-best 10 aces. The Buckeyes had 80 digs, 64 kills and four blocks as a team. Minnesota has one week of regular season to go when it travels to Penn State and Rutgers Thanksgiving weekend. Set 1: The Buckeyes opened the first set with a 25-23 set win. Minnesota began the match with a 6-1 lead as OSU called a timeout. OSU responded and came back and tie the set at 7-7. The Buckeyes took a 13-11 lead as the Gophers called a timeout. As OSU built a 17-13 lead, Minnesota went on a 6-2 run and tied the set at 19. As the Gophers tied the set again at 22-22, OSU used a timeout. The two teams tied again at 23-23 before OSU added back-to-back kills for the 1-0 lead. Set 2: Minnesota took a 10-7 lead off a block from Pittman and Seliger-Swenson. OSU came within one at 12-11, but Samedy added back-to-back kills for a 14-11 lead. Minnesota took an 18-15 lead off Pittman kill. However, OSU cut the Gopher lead to one at 19-18 as OSU called a timeout. The Gophers responded out of the break and went on a 6-2 run to close out the set. Hart had a kill and a 20-18 Gopher lead as OSU called a timeout. After the Gophers’ 23rd point on a Samedy/Morgan block, OSU called a timeout. Minnesota, however, finished off the set on kills by Morgan and Rollins to tie the match, 1-1. Set 3: Minnesota commanded the third set from the 4-3 point en route to a 25-13 win. In the set, the Gophers hit .393, and limited OSU to .000 as it had seven kills and forced seven attack errors. Samedy added back-to-back aces for a 7-3 lead. After a Hart kill at 9-4, OSU used its first timeout of the set. The Gophers, however, continued the pressure and went up 12-5 off a Morgan kill. Minnesota went up 15-7 off an OSU attack error as the Buckeyes called their second timeout of the set. Morgan added a kill on the quick set for a 16-8 lead and 20-10 on a McGraw ace. Pittman added four kills at the end of the set, while she and Hart combined for a block to win the set and take a 2-1 lead. Set 4: OSU took the fourth set, 25-23 to send the match to five. Trailing 10-8, Minnesota got a block from Morgan and Hart, while OSU added an attack error to tie it at 10-10. The two teams tied through 14-14 before OSU rattled off three-straight and took a 17-14 lead as Minnesota called a timeout. OSU built a 20-16 lead off a kill. Minnesota cut the Buckeye lead to two at 21-19 as OSU used a timeout. Minnesota came within on at 22-23 and 23-24 on Pittman kills. However, OSU was able to close out the set on a kill. Set 5: Minnesota opened the fifth with a 3-1 lead as OSU pushed back to tie the set at 4-4. Rollins added a kill and an ace as the Gophers took an 8-5 lead as the teams switched sides. Minnesota pushed the score to 10-6 on a Samedy kill as OSU called a timeout. Hart added two kills to put the Gophers up, 12-8, while an attack error put Minnesota within two at 13-9. An attack error put the Gophers at match point, while Pittman added the kill at 15-11. COLUMBUS, Ohio – Although the Ohio State women’s volleyball team dropped a 3-2 (23-25, 25-20, 25-13, 23-25, 15-11) thriller to No. 3 Minnesota in its last match at St. John Arena, the squad was just the second team in the Big Ten to push the Gophers to five sets this season. The setback puts the Buckeyes at 12-18 overall and 3-15 in conference play while the Golden Gophers move to 24-2 overall and 18-0 in league action. It was a night of career marks for Ohio State. Bia Franklin posted career highs in kills (16), points (20) and service aces (4) and combined it with 13 digs. Becca Mauer chipped in a career-best 14.5 points and 13 kills with nine digs and two blocks. Olivia Dailey was all over the court as she hit .300 (5-2-10) and dished 53 assists, both career highs. Camry Halm dug a career-best 32 balls and handed out seven assists. Vanja Bukilić (12), Lauren Witte (10) and Adria Powell (8) also got in on the kills while Hannah Gruensfelder notched 14 digs. SET 1: The Gophers started the match on a 6-1 run but the Buckeyes responded by going on a 9-2 sprint to get ahead, 10-8. The teams traded points to lock the rally at 23-all. Back-to-back kills by Franklin clinched the set for Ohio State, 25-23. SET 2: It was another back and forth battle that had Minnesota calling for time as Ohio State went up 19-18. Out of the break, the Gophers found their momentum to earn a 25-20 triumph. SET 3: The Buckeyes burned a timeout early as they trailed 15-7. Ohio State tried to hang around but it wasn’t enough as Minnesota powered ahead for a 25-13 winner. SET 4: Neither team was willing to give up much ground to open the frame. Ohio State fought to take a 17-14 lead, which sent Minnesota to its bench. The Gophers cut the deficit to one but Bukilić came through with a pair of kills for a 25-23 decision. SET 5: Minnesota jumped out to an 8-5 advantage at the midpoint of the set. Ohio State stayed close but came up short, 15-11. Any B1G championship is a remarkable thing, but it sure helps when Nebraska and Penn State are both in the reloading stage. . . we’ll see how this all plays out. ..my guess they won’t even make Minneapolis to do anything except watch . . .